When planning a social media campaign, you can’t think of it from a traditional, mass broadcast, spray-and-pray point of view. Instead it needs to be well planned, relevant to the audience and above all, shareable. People will share something if it resonates with them personally such as a social cause, or to keep in touch with those around them. Ultimately though, when someone decides to share a piece of brand content, they must feel that it defines them to their network in some way. In many ways, sharing content is about managing the perception of yourself to others. Your social media campaign will be all the more successful if you can create something that is inherently shareable – think ALS Ice Bucket Challenge or Always’ Like a Girl campaigns. This guide will talk you through every aspect of planning, executing and evaluating a social media campaign. Just like a traditional marketing campaign, a social media campaign requires the talents of many different people to make it a success. While many smaller businesses might rely on one or two people to plan, execute and evaluate the campaign, larger companies that need higher production values need to call on the services of more people. This person will be responsible for the planning of the campaign, determining which channels to use, how much content to publish, what content to promote and for setting the budgets. It’s hard to make an impact in pithy statements which is why the copywriter needs to be a master of brevity and cognizant of the fact that on social media, less is always more. Social media is a very visual medium but whether you choose photographs or illustrations depends on the branding of the company. They’ll also need to have the myriad image sizes that each social network demands memorized or at least know where to instantly find the dimensions. May not be required the entire time but having a professional photographer on the team sure beats having the intern try to take the perfect shot or using stock photos. If you’re contracting a photographer, make sure you have a plan before hand of all the possible shots you want them to capture. It’s no secret that videos out engage all other content on social media when done correctly. Videographers are going to become even more in demand as brands seek to maximize the effectiveness of their advertising spend on various social networks. If an app is being created for the campaign, a developer needs to brought on board. The app could sit on Facebook or it could involve the creation of a micro-site which uses data from the APIs of various social networks. The person who manages the pages on a daily basis, responsible for scheduling and publishing the content. They should also be given a mandate to follow up on user comments and replies as it has been shown to not only increase engagement but also sales. This person has to be the data hero in your team and involved at every stage of the execution. They need to know what content is going to work on different social networks, when to be publishing content, what kind of content gets more engagement, what drives clicks to a website and have data to back it all up. They also need to find out if a similar campaign has been done before. At the end of the campaign they need to create a report that indicates the impact the campaign had on social goals and ideally on wider business goals. There are many aspects that you will need to research before your social media campaign gets off the ground. The most obvious being finding inspiration for a new campaign but also less obvious research such as finding campaigns that have worked for brands in a different industry but targeting a similar demographic. The second part of the research is to broaden your horizons and looking beyond your own industry to see what kind of social media campaigns have worked for brands in other sectors. Normally this would be quite hard to do but Unmetric has a team of data analysts that tag and group social media content from Facebook and Twitter together into unique campaigns. These campaigns can start from as little as just two posts and cover any time period. You must consider the cost of promoting the content. The more content that you have, the higher the promotion costs will be. If you already have a designer and a library of images to use for your campaign then your major costs will be for the promotion of the content on social networks. Unfortunately, without a paid push behind the content, the campaign is likely to fall flat as not enough people will see it. If your budget for promoting the content on the social networks is effectively zero then your campaign is unlikely to see any level of success. If you are wondering how much content needs to be promoted on Facebook and Twitter, considering signing up for Unmetric’s promoted post detection service which delivers weekly reports on which posts have been promoted by your competition. Engagement – the aim is to generate higher engagement during your campaign than you would normally do. How well the campaign engaged should be benchmarked against campaigns of your competitors. Average Reply Time – if the campaign involves plenty of interaction with the community, the average reply time of your brand to user questions on Facebook and Twitter should be measured. Daily/Monthly Active Users – if the campaign involves a Facebook app, it is vital to track the number of Daily and/or Monthly Active users of the app and to benchmark it against the wider industry. Reach/Impressions – a specific campaign should have the objective of reaching far more people than you normally do on the various social media profiles managed by your brand. Sentiment – Measure the sentiment over a period of time to understand how it has shifted before, during and after the campaign. (Need more information about these terms? Download our 29 Terms Every Social Media Analyst Needs to Know). Aside from the most obvious business objectives of revenue and number of customers, there are plenty of other business metrics to consider measuring for your campaign. The business metrics will be different for each brand and even different for each campaign that they run. Website Traffic – Very important for retail, e-commerce and other brands that generate revenue from their website. Brand recall – Larger brands that can employ the services of market survey companies like Nielsen can run surveys to see if there is an increase in brand recall amongst the target audience. App Downloads – Getting your app on the smartphones of your customers is a great way to increase revenue and app downloads should be a key metric to measure. Leads – Sending people to a website to collect email addresses is the number one way many B2B companies drive leads into the sales funnel. What’s worse than turning up to the party in the same outfit as someone else? Launching your campaign with a bang and discovering on Adweek that your campaign is exactly, or scarily similar to one launched by another brand a few months ago. Competitive intelligence isn’t just useful for benchmarking, it can help you avoid pitfalls of other brands and avoid any embarrassing matching outfit situations. Once your team has decided on the goal of your campaign, the format of your content should present itself quite clearly. Certain aspects of traditional campaigns will undoubtedly make their way into your social media campaigns as well. In the same way that your TV ads should be uploaded on YouTube, your print adverts can be recycled for social sharing as well. However, in social media, you need to create a much higher volume of content for a campaign. By completing the competitive intel exercise in the Pre-Execution process, you should have an idea of the kind of content that works best for the goal of your campaign. If not, a team brainstorm session is the best form of inspiration – Remember, as easy as it is to put a couple of puppies in your content, if it isn’t cleverly tied to your brand and campaign, it’s worth rethinking. Social Media has created a relationship of interaction between vendor and customer, and to leverage this, it helps to create an interactive quality to your campaign. From the selfie craze to the Ice Bucket Challenge, campaigns that encourage participation have captured audience attention and will increase your chances of virality. There’s no magic number of posts or videos or tweets that ‘make’ a campaign, but a neat and efficient method of tying a campaign together, is the use of a distinct hashtag. Picking which channels to display and promote your content on comes next. There is no shortage of social networks and apps that you can display and promote your campaign on, and there seems to be a fresh crop of ‘the next big thing’ every other day. Right from claims that Instagram was ‘taking over’, to Snapchat and Periscope – the marketing industry has been the victim of what can only be described as fear mongering too often. At SxSW 2015, you couldn’t take five steps without being lectured on how Meerkat was going to be the ‘next big thing’, and now Meerkat is just an additional platform your brand needs to be worrying about. Brands must remember – social networks and apps are not built equally. Certains kinds of campaigns require different kinds of engagement, so make the decision of which platforms to advertise on based on your campaign, not the other way around. Apps that allow ephemeral messaging like Snapchat and Meerkat are amazing for campaigns around live events – you can post as many photos or videos without burdening your audience with too much permanent information. However, for lasting power – the ‘traditional’ social networks like Facebook, Twitter and Instagram are still clear favorites when trying to have meaningful engagement with your audience. Not only will your message not disappear, it can be commented and shared upon – a level of interaction absent from newer apps. Paid media ensures that your campaign reaches the intended audience, and with clever targeting options available through Facebook and Twitter, you can avoid wasteful spending as well. You will need to implement a combination of multiple marketing strategies to realize the potential of your campaign and one such strategy is to integrate your online social campaign with offline media. One of the key benefits of the integration strategy is the reach of the campaign to a wider audience. Again, understanding your target audience will be a key factor in how you go about doing the integration. Since people consume information via both online and offline media sources, it is necessary to have a consistent message across these channels. For example, the hashtag used for the campaign can be printed on all collaterals used for the print media and can also be used for both TV and radio ads. Similar imagery and theme that is used for the online media should be used when displaying ads on billboards, newspapers, etc. Organizing offline events, meetups or tweetups around your campaign is one other strategy that is effective in integrating offline media with online campaign. This will create more awareness for the campaign and will help in generating more buzz. “How often should I post?” is one of the most common questions asked by marketers and there is no correct answer. Consistency is the key when comes to social media content distribution. But the actual number of times to post on various social networks will depend on your content, your audience and your industry. As a first step to figure this out you should be clear on what business goals you would like to achieve. Do you want to see more engagement on your content or do you want to direct people to your website where they can make a purchase? Once you are clear on your goals you should follow the ‘test, measure and repeat’ approach. Test how your content performs over a certain period of time and measure the results. You will be able to find out which type of content resonates with your audience and post more of that. Closely monitor the days of the week your audience engage with your content. You can also drill deeper to find out which time of the day your content performs well. You can easily figure this out using the Unmetric platform which gives you a quick analysis of how your posts have engaged each day and each hour. 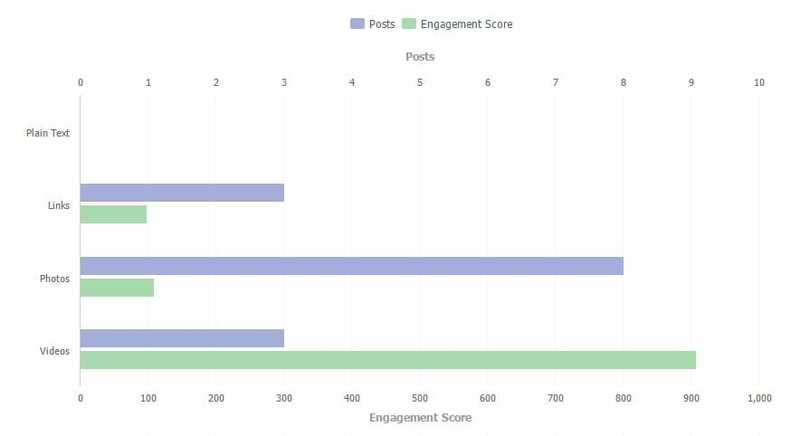 Measuring the frequency and timing of the posts across social networks will help you to analyze how the engagement on your content varies across social networks. Once you’ve gleaned insights from the experiment, repeat it again with different metrics till you have achieved your business goals. 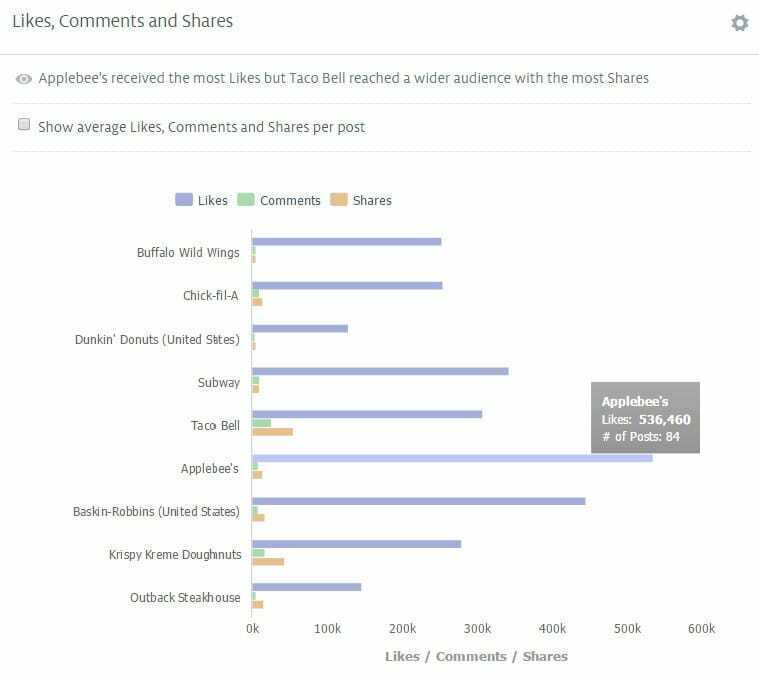 Bonus tip: Analyse your competitor’s content performance and post frequency. You can definitely pick out a few insights from your competitors that you can implement in your content strategy. The Unmetric platform comes in handy in this regard where all your competitors’ social media strategies are laid bare and you will be able to glean insights from your competitors within minutes. Pick the right social platform to run your campaign based on your business goals and your understanding of your target audience. If you are not very sure of which social networks to start with, you can do a competitive analysis to find out on which platforms your competitors are running their campaigns and where they engage the most. Here is an infographic which can help you choose the right social network based on your business objectives. Engagement of your campaign post on any social platform will depend on how your creatives capture the attention of your audience. For example, choose the images that will resonate with your audience and use the lingo of your target demographic on your ad copy. Put yourself in your audience’s shoes while planning for the creatives for the campaign. Create multiple posts for a single campaign with different images and copy and then do split testing to figure out which of these posts performed well. Using Facebook’s Dark Posts advertising feature lets you test out a variety of content before publishing it on your page, but you need to allocate a budget for this testing in the planning stages. Place a clear and simple Call-to-Action (CTA) button on all your ads. The copy and the color of the CTA button should be compelling enough to be clicked. Refer to these best practices when designing our CTA button. Each campaign should have a dedicated landing page with contains the similar messaging, color codes and theme of the ad. Consistent design on both the ad and the landing page will help in reducing the ambiguity and result in better user experience. Refer to these best practices when designing landing pages for your campaigns. To determine whether your campaign was successful you should have the right tools measure it. A best practice to measure success would be to add UTM codes to all the links on your ads and landing pages. UTM codes are snippets of code appended to the end of a URL to track the success of your content. These codes will let your analytics program know the source of traffic to your campaigns and will help in analyzing various other key metrics like ‘bounce rate’, ‘time on site’, ‘page views’, etc. Use a free tool like this one to build your UTM codes and even consider heading over to bitly.com to shorten the URL and create a way to track clicks in the process. Once your campaign is finished and out there for all digital viewing, there is only one thing left to do – measure performance. With that solid strategy all set to put your brand under the spotlight, the right kind of post campaign analysis is your stepping stone to virality. With Facebook increasingly limiting organic reach, you potentially could only be reaching 7% of your fans now (and perhaps even less now). The amount of money you put behind your content and the specifications you use in your advertising makes a lot of difference in the performance of your post. This is why a share becomes more valuable than a Like or a Comment. The best, most targeted way to get your post seen by more people (of the demographic you care about!) is to have your fans share them. This is why content being shareable and fan friendly becomes extremely crucial. Even comments have branched out as a tool to tag friends exclusively making it a targeted share. With this type of lateral reach, your engagement could shoot up and pave the way to virality. Content on Twitter is easier to promote given it allows businesses to organically reach a larger portion of followers as compared to Facebook and Twitter ads give marketers to customize paid campaigns at a granular level. Metrics can detail which pins are getting the most engagement, which boards are the most popular and where followers are spending the most amount of time. These metrics aid in tracking pin performance, board performance and also offer valuable insights into directions your content should take. Emarketer says Instagram is growing its user base at rapid rate – much higher than anticipated. The analytics and advertising capabilities of the networks is growing and measuring it is becoming even more important. Though performance on each social network can be analyzed individually, when it comes to campaign measurement, a wholesome approach is essential. For example, tracking where viewers come from to your YouTube videos could help understand which channel is bringing the most traffic. Each network’s distribution strategy should complement the other networks. On the Unmetric platform, cross platform measurement is well categorized and all available under a single tab. We have an exclusive team of human analysts tagging each and every campaign (big or small) so you can access social media campaign intelligence at the click of a button. The human cognizance helps identify top campaigns while the algorithms track all the numbers. Not only can you analyze your own social media campaigns, but can also compare it with campaigns from your own peer group. 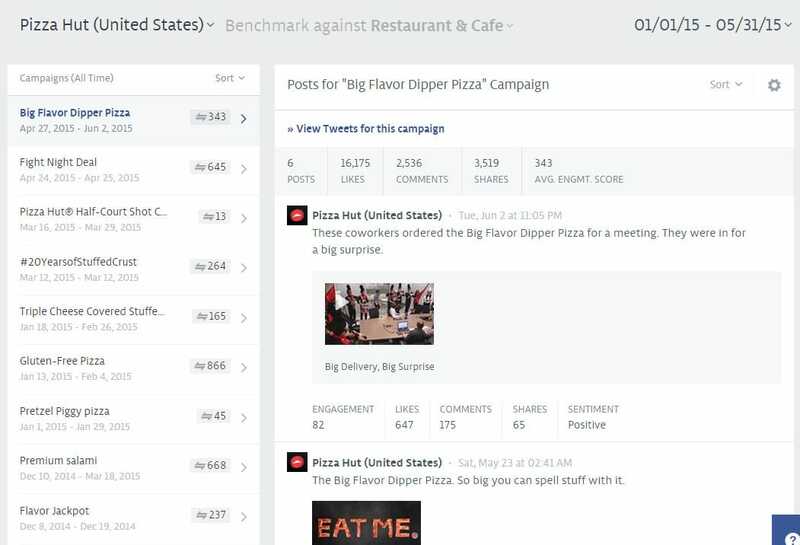 The dashboard will allow you to navigate between social networks to get a complete view of your (and your competitors’) campaigns across social networks. What’s more? All this can be compiled into an impressive report at the click of a button on the Unmetric platform. However, effective campaign performance and in turn measuring happens only when you have a well-defined goal that you are trying to achieve with the campaign. Earlier, though advertising campaigns took a variety of creative routes, they had a very laser targeted goal – increasing revenue. Let’s be honest, irrespective of the marketing channel, that remains to be the ultimate goal even today. Though we discuss engagement, personalized marketing, etc, the one question all bosses have at the end of the day is – “What did that bring us?”. Here is your key to answering the infamous social media ROI question. Measuring ROI differs for each industry. Remember when all TV ads could do was influence a viewer and reinforce brand awareness/positioning? It still is the case today, but we learnt to measure ROI by checking increase in sales post a campaign launch. Why can the same not be valid for social media campaigns? With digital audiences spending over 6 hours online every day, isn’t it the perfect medium to spread awareness and brand recall? If that’s still not enough, take the retail industry for example. A viewer doesn’t even have to wait to go shopping to buy that thing they just saw in the ad, with links to your online store in your social media content, viewers can shop what they see right away. Immediate ROI. Online shopping hasn’t just changed the way we shop, it has also made increasing sales through digital ads that much easier. Say you’re a QSR brand looking to increase sales through a food ordering app. Twitter has exclusive ways to advertise so you can target a particular type of OS users (Android, Windows, iOS etc.). Based on industry and brand, challenging business objectives such as increasing restaurant walk-ins, encouraging purchase or even raising donations in the case of NGOs can be accomplished. Smaller goals such as driving traffic to website, increasing fan involvement or targeting a defined demographic, can be achieved and measured with extreme precision. McKinsey found that a telecom company reduced 30% of the cost of its customer service unit by migrating to digital care and also found that customer satisfaction drastically improved as the support journey was completely digitized. 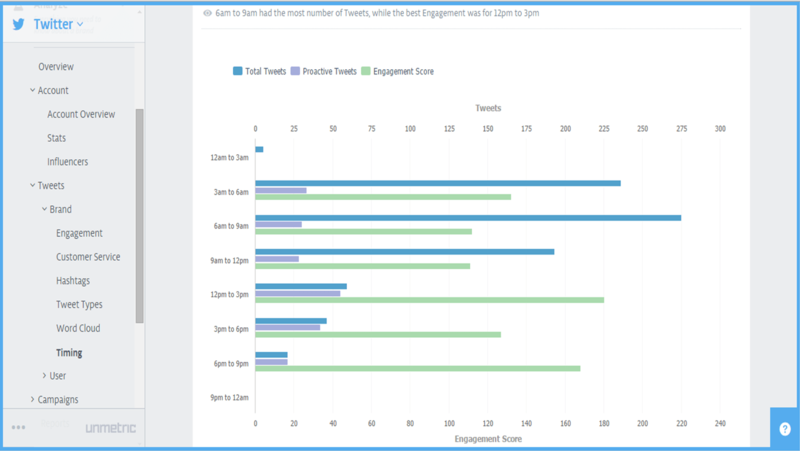 Unmetric found that JetBlue replied to user tweets within 15 minutes, while the average brand took 10 times longer. The air carrier’s exceptional customer service on Twitter brought them recognition in the form of multiple Airline with Best Customer Service awards. Achieving objectives like these aren’t always visible when looking at social media in a silo, but when placed in the bigger picture, you can see that social campaigns contribute to the success of even the larger companies. Data always says a story. If you hear close enough and pay attention to the patterns it display, gaining insights on what’s going on with your social media campaign is quite simple. Not just aspects such as one post being shared more than another. Composite metrics such as customer service, sentiment, share of voice give you a better understanding of your campaign’s performance. Share of Voice – To uncover reach of particular topics, you can use this understand how frequency of posting affects engagement. Tweet Type – The tweet formats (link, image, hashtag, mention) that resonates the best with your audience. This allows you to assess your own and competitor’s strategy. Content Type – Content format on Facebook through which you can uncover the entire strategy of brands and also tweak your own strategy by measuring performance. Customer Service – Customer service is a combination of @mentions, replies and time taken to reply. This metric can help you uncover how a company’s support team is staffed, understand their support strategy and even discover their operation hours. 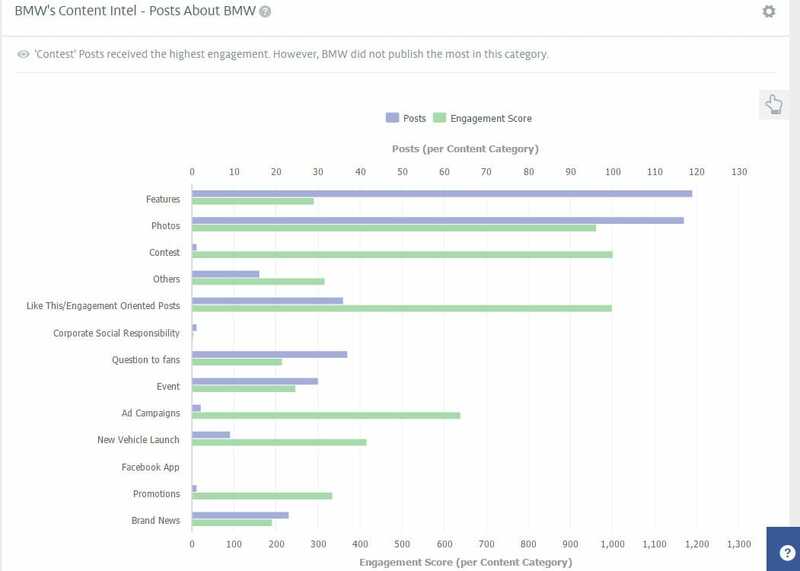 Similarly, detailed metrics like these allow you to go beyond numbers and dissect campaigns as a microscopic level. With insights that are rooted in data, your reporting will gain a lot more credibility. Reporting is fairly simple. The real challenge lies in translating that to actionable learnings and feeding it back to your creative and planning teams. This final step becomes a lot easier when the analyst has a clear understanding of how the campaign performed with the crucial factor of why it performed a certain way. This is discovered when a combination of the above three measures are put together. If your ART is higher than that of competitors and they seem to be getting better sentiment, bring it to the notice of your customer support team. You can even identify mentions that are getting more attention than the others to identify the concerns to address first. Timing can be one of the game changing metrics to help your community managers perform better. Unmetric’s Time of the Day module which is customized per your geograph, will tell when your fans are active. You can increase frequency of content in this time period for better reach. Immediately after a few video has been uploaded to YouTube, check to see which is getting better views growth and ask your team to schedule more content with that. Unmetric’s Content Strategy helps understand what types of content is resonating best with your audience so that you can produce more of that particular content type. Say Festival greeting have been performing better for your industry while news about general happening have been performing better for your brand, you can suggest that your creative team cuts back on certain other types of content while increasing these two types.